Langlinais is a native of Erath and went through school at Erath High School, where he graduated, valedictorian in 1961. He also excelled football and track during his High school tenure, while winning All State honors in track his four years in High school. He received his BS degree from USL in 1965 and then earned his master’s degree from LSU in 1966. In 1969 he acquired his Professional Engineering (P.E.) license, and in 1971 he acquired his Professional Land Surveying (P.L.S.) license. At the age of 25, he accepted a professorship at USL and taught Agricultural Science for thirty years. 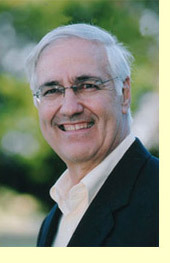 After retirement, Steve Langlinais was named the “Outstanding Alumni of the College of Life Sciences” in 2001. That same year, he was named "State Engineer of the Year ", by the Louisiana Society of Agricultural Engineers. He was named King Vermilion IV, by the Krewe of Vermilion in 2003, and served with his youngest daughter, Beth, then Queen Vermilion IV. Over the years, Steve became a good friend of the late Relie LeBlanc, who encouraged him to go to Nova Scotia with the LeBlanc family in 2002. While he was there, Langlinais learned that the first Langlinais (Jean Don) to come to America from France married the granddaughter (Celeste) of the first LeBlanc (Daniel) to settle in Acadia, Canada. While on the tour, Relie and his friends in Canada visited a place they believed to be Daniel LeBlanc’s homestead. Steve was part of a genealogy lecture at the University of Moncton in Moncton, New Brunswick, where he discovered his tie to the LeBlanc’s. Stephen became fascinated with the history of the area heard first hand from many people about the deportation of the Acadians in 1755, many of whom were Broussards. When he returned to Louisiana, he became highly motivated about telling the story of the Acadian deportation and their way of life to everyone he met. They were so much like the people of south Louisiana. In 2004, the Langlinais’ returned to Nova Scotia for the Congres’ Mondial celebration, where this time he explored the Broussard family. Langlinais’ parents, Wilfred Langlinais and Anna Broussard Langlinais, both deceased, raised their children on a rice and dairy farm north of Erath. They were taught honesty, integrity, and hard work. Many a day Steve was up at 4:00 a.m. to milk cows before school. Then he spent the day at school, practiced football and track, and went home to perform his chores on the farm. After supper, he’d hit the books, very often till midnight before retiring to sleep, then was often up again early to do farm chores before going to school. He spent his summers working in rice fields on the farm and working at his father and Uncle’s business Langlinais Tractor Company, which is still a thriving business for over 50 years in Vermilion Parish. Stephen Langlinais is married to Juliette Toups of Henry and they have five children: Ann Lori Hebert, Dana Granger, Carrie Kimbell, Ben Langlinais, and Bethany Langlinais.